Manage installed plug-ins for Apple Mail. Is there a better alternative to Mail Plugin Manager? Is Mail Plugin Manager really the best app in Productivity category? Will Mail Plugin Manager work good on macOS 10.13.4? 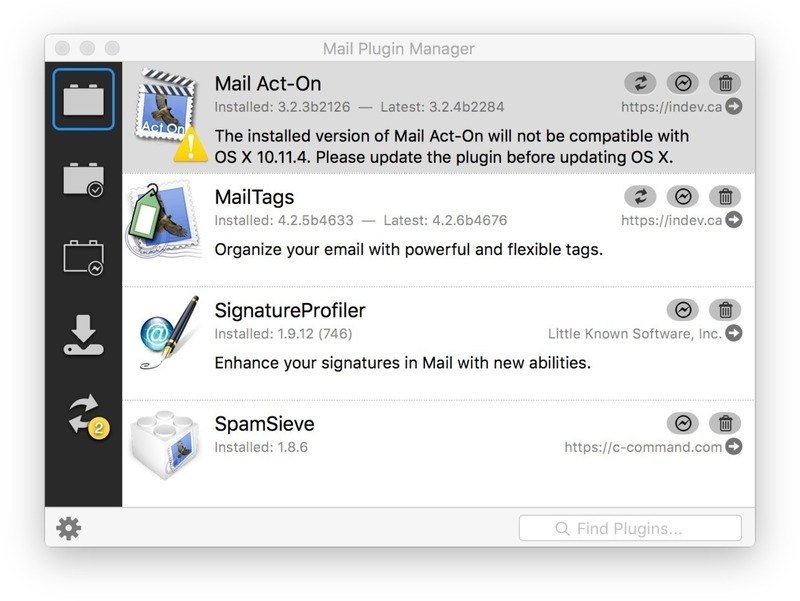 Mail Plugin Manager is the missing manager for OS X / macOS Mail plugins. Use it to manage all Mail plugins installed for OS X / macOS Mail. New: Remove installation & update features, since they were too unreliable. Fixed: Change to ensure that the data is as up to date as possible. Fixed: Remove the caching of the bundle information in order to ensure it is always valid. Mail Plugin Manager needs a review. Be the first to review this app and get the discussion started! Mail Plugin Manager needs a rating. Be the first to rate this app and get the discussion started!